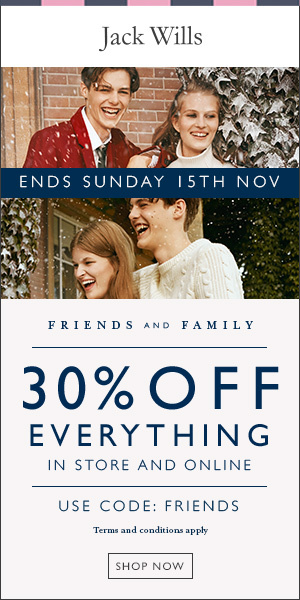 Jack Wills' Friends and Family Sale goes live tomorrow! This is one of our biggest sales of the year as we are offering 30% off EVERYTHING in store and online. Start promoting this great sale when it goes live (Thursday November 12th), and as always enjoy free delivery on orders over $75. Promotion: Enjoy 30% off EVERYTHING in store and online for the Friends and Family Sale!